Is it a common mental model, that in a chart visualizing a time dimension, the time is advancing to the right? I'm currently working with the Internation Business Communication Standards (IBCS). They are trying to establish a globally accepted standard for business commications, e.g. charts. © 2015 IBCS Association. Licensed under Creative Commons BY-SA 4.0 International. To me this sounds quite natural. But I was wondering if this mental image of time advancing to the right holds true globally. I could imagine, that in a culture writing from right to left (or from top to bottom) the natural interpretion of time flowing is different. Are you aware of any cultures who think about time advancing differently? The mental image of time is indeed thought to be influenced by language and culture. Scientists discovered years ago that spatial representations of time are affected greatly by linguistic conventions. If English is your native tongue, you're likely to think of time as moving from left to right, but if Arabic is your language of choice, time moves from right to left. These differences can be traced to the direction in which one's language is written, either left-to-right or right-to-left. From the Psychology Today article Is Before to the Left of After? The languages of the Pormpuraaw, a remote aboriginal community in Australia, include relative spatial terms like left and right, but they're rarely used. Instead, speakers of these languages rely on absolute terms that correspond to the four cardinal directions. Pormpuraawans generally think of time as moving from east to west, just as the sun does in its daily journey. With regard to charts, time is generally the independent variable and it is convention for the independent variable to be presented on the x (horizontal) axis. 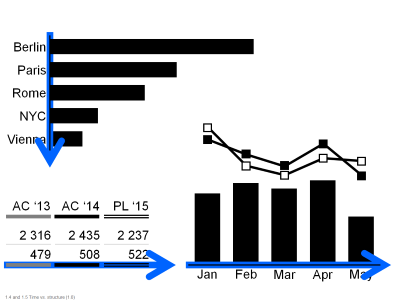 In the Arabic world, time series charts are more often shown as right-to-left, as this flows more naturally with reading from right-to-left. 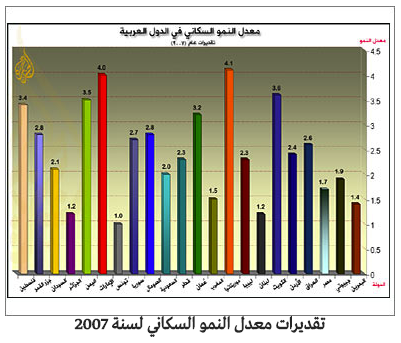 Al Jazeera (a large Arabic based news organisation) for example user right-to-left charts quite regularly, as shown below. Note that I have no idea what this chart is referring to. However, most speakers of right-to-left languages are also comfortable with left-to-right charts simply because they are exposed to them regularly. So if you want to target right-to-left languages specifically, your audience is more likely to be comfortable with right-to-left time series charts. However if your target is broader, I would opt for left-to-right charts as they have a much wider acceptance (taking RTL and LTR languages into account). Not the answer you're looking for? Browse other questions tagged time internationalisation mental-models culture rtl or ask your own question.